With beautiful photography, engaging writing, and signature hand-knit designs, Colours of Shetland will inspire you with the varied shades and hues of Great Britain’s most northerly isles. From writer and designer, Kate Davies, comes a book that brings the process of hand-knit design to life in an exciting new way. In Colours of Shetland, Kate takes you on a northern journey, exploring wild and beautiful island landscapes through words, projects and pictures. Situated in the rich context of the Shetland places, wildlife, objects and people that have inspired Kate, each design in this book has its own engaging ‘colour story’ to tell. 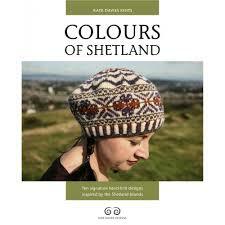 Through these pages you will get a taste of the heritage that makes Shetland one of the world’s most knitterly destinations and be inspired to knit with yarn that has a genuine connection to the landscape in which it is produced. Each project features the clear instructions, beautiful finish and attention to detail that are hallmarks of Kate’s designs.